Students: What's New in 3.5: Welcome to Moodle 3.5! 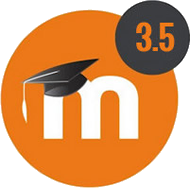 We upgraded to Moodle 3.5 on September 5. While there are not any significant changes in functionality going from version 3.3 to 3.5, there are some nuances and enhancements that we think you'll appreciate. Jump to... Jump to... Respondus 4.0 Web Services Faculty: Request Moodle Archive Retrieval Faculty: What's New in 3.5 Student Guide to Moodle Two Minute Moodle for Students (CC) Missing Classes?